“Today’s celebration marks one more success underlining the strength of the U.S.-Greece relationship on multiple fronts in terms of defense and security cooperation, people to people ties, and of course the critical area of trade and investment,” the US Ambassador said. 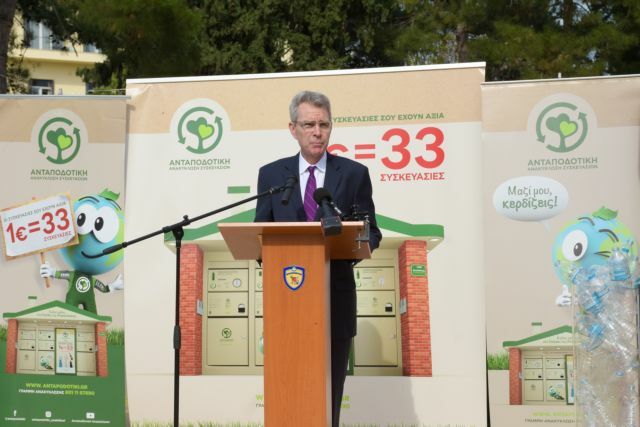 US Ambassador to Athens Geoffrey Pyaty underscored the multi-level cooperation between the US and Greece in remarks at a ceremony at the Papagos military camp launching the first recycling unit. Along with the Greek company Texas Environmental Management, the US company Envipco assembled the machinery in Greece. “Envipco, headquartered in the U.S. state of Connecticut, is a world leader in the manufacturing and development of automated recycling machines,” Pyatt said. Underlining the importance of the US being the honoured country at the Thessaloniki International Fair in September, Pyatt said that it created “great momentum moving into the U.S.-Greece Strategic Dialogue, which will launch in Washington on December 13th under the chairmanship of Secretary of State (Mike) Pompeo”.